At least 18 people died and 33 were injured in Panama Sunday when a bus veered off a highway and flipped into a ravine and then a river, the authorities said. Image used for representational purpose only. 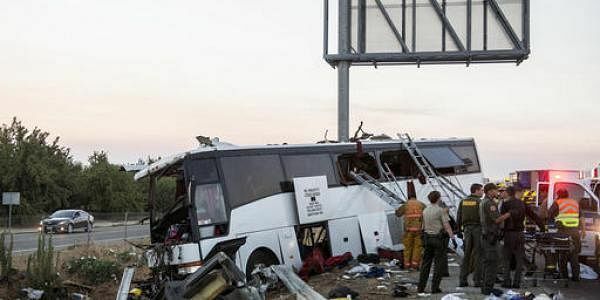 PANAMA CITY: At least 18 people died and 33 were injured in Panama Sunday when a bus veered off a highway and flipped into a ravine and then a river, the authorities said. Civil Defense officer Jose Donderis said the bus headed from the Bocas del Toro province on the Caribbean Sea to a ranch in Chame -- a town on the Pacific Ocean some seven hours away -- crashed near Cienaga Vieja in Anton, Cocle province, southwest of Panama City, around 1900 GMT. "It is a really dramatic accident," he said, adding that the cause was not yet known. "The entire bus, the inside part of the bus, was squeezed into the part where the driver would be and a lot of people were trapped there." Many of the injured were in critical condition, Donderis said. He had previously reported 10 people died in the crash. Other passengers drowned when the bus fell into the river, Donderis added. Helicopters and ambulances have been sent to the scene, he said.